Compared with other transportation tools, train is more reliable for foreign travelers since foreign travelers can the find train lines on maps and find the timetables easily. Some train stations are also transfer center at which you can take shuttle bus or metro. 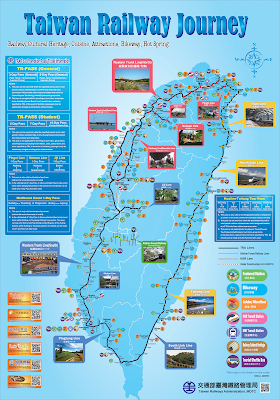 Here is some information about train in Taiwan you may need when you travel in Taiwan. In Taiwan, there are 2 railway systems in Taiwan, Taiwan Railway Administration(TRA) and Taiwan High Speed Railway(HSR). Along the way of HSR, some stations are connected with TRA and Metro stations. 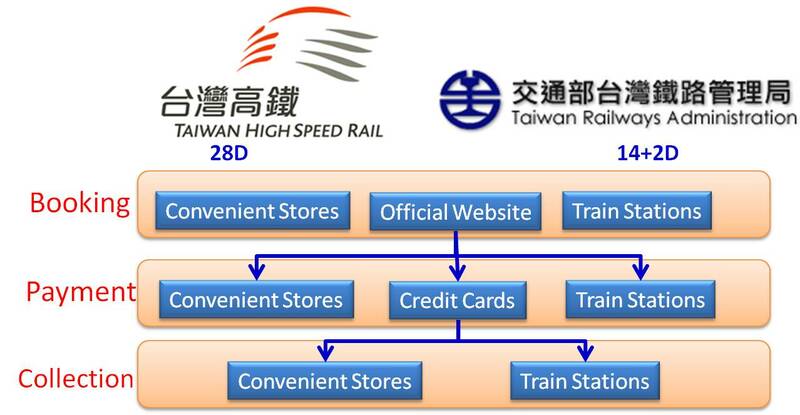 Be noted that the same stations of TRA and HSR may have different names. HSR connects major west cities, including Taipei, Taohuan, Hsinchu, Taichung, Chiayi, & Kaohsiung. HSR has only one train type and 2 kind of train schedules: stops only at Taichung or stops at all stations. The fastest HSR train can finish the 350 KM within 90 minutes. Yon need to wait in the queue of car 10(9)~12 if you buy the non-reserved tickets, which is only sold on spot. TRA has a round island network and includes some branch lines, ex Pinxi line, Jiji line, Alisan line etc. Like most countries, it takes time to understand the railway system and book the ticket. You can follow the steps mentioned below to book TRA tickets easily. 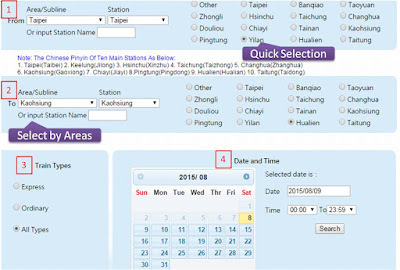 Most foreigners ask how to book the trains tickets. Booking implies booking reserved tickets with seats number. But you can also take TRA train with non-reserved tickets which you can buy at the ticket vending machine or ticket window in the railway stations. You can also use EasyCard as well. 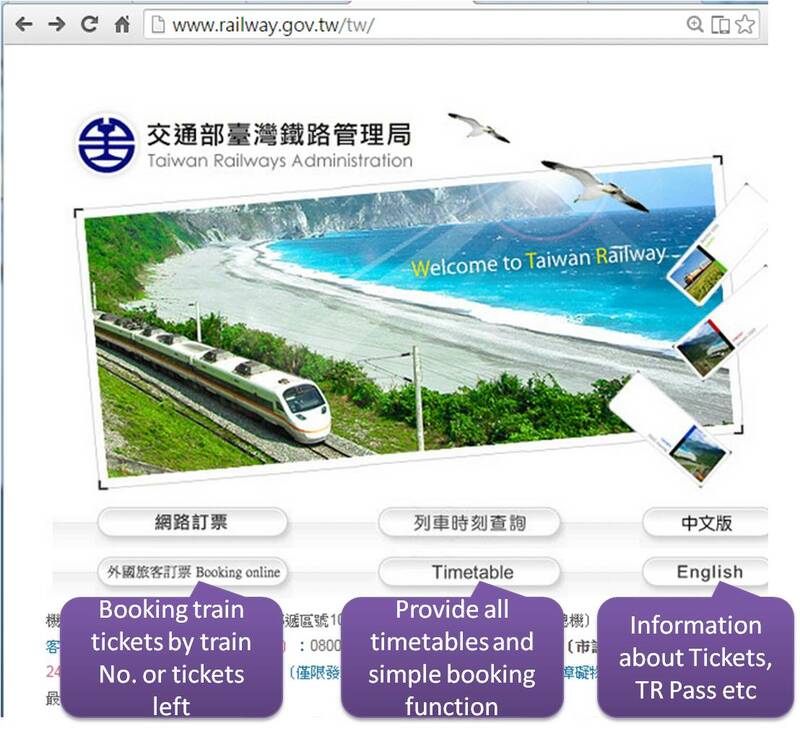 The official portal site of TRA is http://www.railway.gov.tw. There are 3 choices. Please select "Timetable" first. Choose your initiating station, then your destiny station. Before clicking searching, remember to click "All Types" in "Train Types" section. Since the default in "Train Types" section is "Express", you may find only a few trains or even no train if you forget to change the "Train Types". The most frustrating part of reading the timetable is to identify the train types. Most guides books introduces that TRA has some different train classes and can classified into 2 level: Express Trains(Tze-Chiang, Fu-Shing, Chu-Kuang Trains) and Ordinary Train(including Ordinary and Local Trains). For a local Taiwanese, sometimes he/she may be also confused about these train types .For a foreigner traveler, I would suggest an easier way to identify these trains. The following picture illustrates the timetable from Luodong to Hualien. 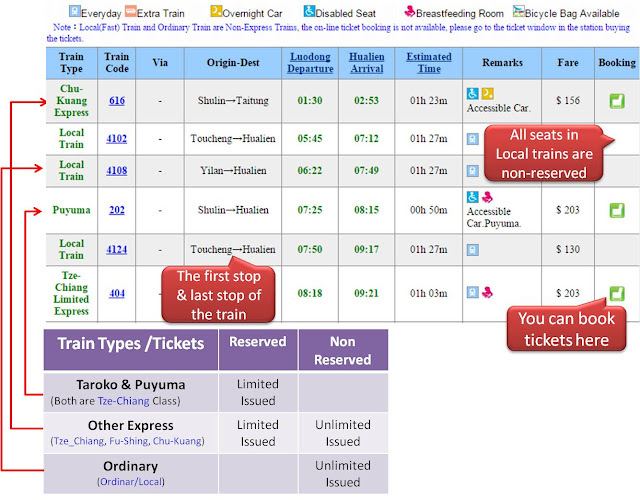 Taroko and Puyuma Express only sell reserved tickets and you must book in advance. Ordinary train only sells non-reserved ticket and the non-reserved tickets are sold on spot (you can use EasyCard instead at most TRA stations ). EasyCard is acceptable in the west train lines. You can also use EasyCard instead of buy non-reserved ticket for Ordinary and Other Express Express trains. You can enjoy 10% discount and don't need to wait in the queue in front of the ticket window/machine if you use EasyCard. Some people may be confused with the Origin-Dest. It meas the first stop and last of the train and is nothing to do with your journey. 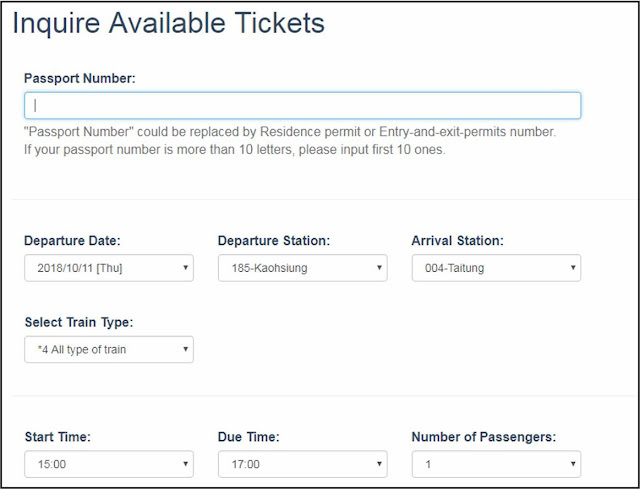 Sometimes, it is difficult to book the train you prefer but you may change your itinerary if train tickets of other trains are available .You can use "Inquire Available tickets" in the Booking inquery function from the TRA official portal site. "Inquire Available tickets" can check whether tickets are available given that you have input the date and the number of passengers. Remember to choose "All types of train". As mentioned at the beginning, you can only inquire reserved-tickets here. This is not timetable function. The result won't show all train in the timetable. You cannot find the Ordinary Train and Express Trains that reserved tickets are sold out but non-reserved tickets are available. Since the train stations is order by the geography order, the following codes are useful when you book train tickets. There are lots of methods to book, pay, and collect your HSR/TRA tickets. Booking, payment and collection are independent. You can choose the most convenient methods. If you book HSR/TRA ticket at convenient stores or train stations, you can finish payment and collection at the same time. However, most people book train tickets in HSR/TRA official website. You will get a series number after booking online. You can pay with your credit card online at the the same time. If you have paid TRA tickets, you can collect your TRA ticket until the last 30 minutes before departure time. THSR has different regulation. If you have paid HSR ticket, there is no regulation when you should collect your ticket. Passengers can change the HSR booking once without charge before 30 minutes prior departure. For a foreign traveler, finish booking and payment online at the same time would be better. The deadline of payment is the end is T+1. For example, if you book successfully at 10am, 1 May, the payment deadline would be 11:59.59 pm ,2th May. You can collect your ticket at convenient stores. Just show the staff of convenient stores your ID and ticket SN and they can help you to operate the kiosk. There are over 10,000 convenient in Taiwan. It costs only extra NTD 10(HSR)/NTD 8(TRA) for each ticket. Don't collect your ticket at the train station at the last minute since there could be a long queue in front of the ticket window. Since you cannot take Taroko/Puyuma express unless you have bought reserved tickets and local train sells only non-reserved tickets, what we talk in this section is the non-reserved tickets for TRA other express. TRA non-reserved tickets, in fact, are no-seat tickets. 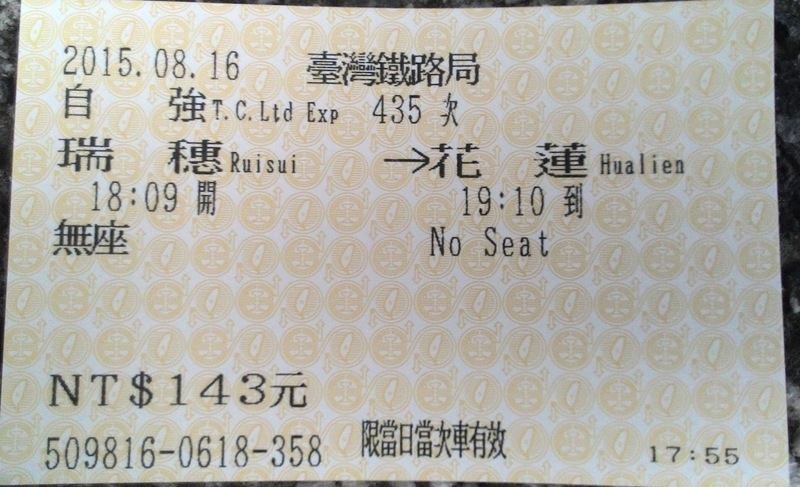 Although the name form HSR/TRA non-reserved tickets are similar. the rules for HSR/TRA non-reserved tickets are different. The following table compares the difference between HSR and TRA non-reserved tickets. Since there are over 200 train stations and lots different classes of train, there are some trips you may need when you books TRA tickets. It is always hard to book the train tickets between Taipei and Hualien/Taroko. Combo ticket is a solution. It is cheaper(about NTD 200, about 50% off comparing to Tze-Chiang class), flexible, and always availble. For more information, please refer to Transportation Between Taipei And Hualien (Taroko). By the way, if you want to go to Taroko, the cloest train station is Xincheng(Taroko) Station, Hualien Station is 20 KM south of Xincheng(Taroko) Station. It may waste you up to 2 hours if you book the train to Hualien. 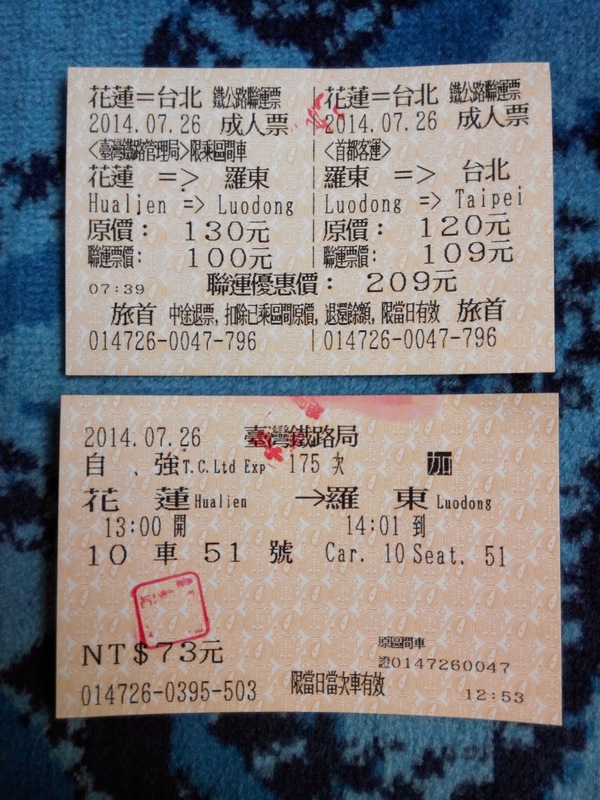 Since fewer trains stop at Xincheng(Taroko) from Taipei, Combo ticket also provide a better solution for this problem. Along 1,100km TRA rail, there are some train garages next to train stations. Since the garage statons are also the original station final station, yo can find more trains available if you take these garage station as your intermediate (transfer) stations. 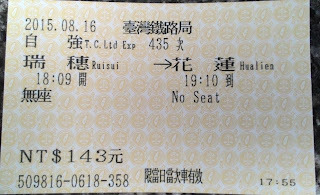 For example, if you chekc the train between Kaohsiung to Hualien, there are only 10 trains available. But if you check Kaohsiung<－>Taitung, <－>Hualien, you will find 16 and 23 runs. That's also the one of the reason why combo ticket provide more runs of trains since there is a train garage at Yilian stations. Since the deadline of payment is T+1, some may try to book at 12am at T+2. It may work. However, the solution may not be as good as you thought. Since TRA will cancel the right of booking if passengers book but not pay before deadline for a few times, lots passengers will cancel the booking by themselves. Therefore, you may try to book at 12am. But you had better try to inquire available tickets all the time. If you have paid, you can collect your ticket until the last minute. Looking at the train time table above (from Luodong to Hualien), what does the thrid column ("Via") refers to? As I check the timetable, there are certain trains that appeared "Mountain Line" and some is blank. Is there any difference? The information is not related to your itinerary. There is no difference for the train between Luodong to Hualien. Via means go by. If you check the northwest side of the map "Taiwan Railway Journey", you will find there is a loop. The west line is coast line and the east line is mountaion. Booking Japanese train ticket is out of the scope of "Taiwan Itinerary"
I'm arriving at Taoyuan airport on 28 June and my hotel that night is at Hualien. I want to take the TRA (not combo) to Hualien. Am I right to say that I have to go to the TRA official site - http://railway.hinet.net/net_eng.htm to book my tickets? When I go into the website, I am not able to book my ticket for 28 June, is it because it is sold out already? I understand that for children under 115cm its free but do they get a seat as well? If I want a seat do I pay for a child seat? If you need a seat for your child, you need to buy a ticket. The price of a child ticket is half of a normal ticket. Hi Sullivan :) thank you for sharing this.. 1 question - will it be a problem if I don't have the credit card that I used to pay for my ticket with me when I collect the ticket? You have to paid within the deadline, normally by the end of 2nd day. If you are at Taiwan, you can pay and collect convenient stores. Thank you again :) Happy New Year!! How many days out can you book...on the website looks like it is less than 1 month out...is that correct? You can book TRA tickets 14+2 days in advance. Are there too overcrowded on Lunar new year? Should we buy ticket online first to have a reserved-seat since we have 3 years old kid. Thanks! If i want to use TRA from Taipei main station to Ruifang station on Monday, 3rd April 2017 around 7AM, do i need to book the ticket online in advance? Basically, can we purchase the ticket on the spot and get a seat inside the train? Does the train has a "non-reserved seat" coach? Also, do you know about the TRA timetable from Taipei to Ruifang station? You don't need book online in advance since local train does not have reserved seats. Since that's the direction off the city in the office hour, it is easy to finds seats available in local trains..
You can input Station Name directly. 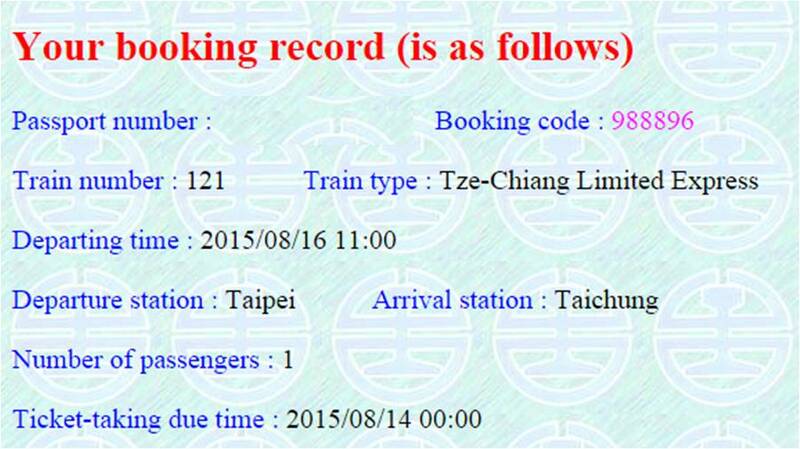 Is it necessary to purchase Tze Chiang TRA ticket one week in advance (Taipei Main Station -> Ruifang Station)? I am planning to purchase the reserved seat one if possible as the journey might be 50minutes. Also, is it easy to get the train back to Taipei Main Station from Ruifang station at night (around 8PM) ? Do i need to book the ticket in advance or just straightly go to whichever train comes around that time as long as it is going to Taipei Main Station? Will it be cheaper if I buy the ticket online? You are so nice to make a very detail guide for oversea tourist to book Taiwan Train ticket online. I also have a question would like to ask you. After finishing booking train ticket online, can I get my real ticket at 7-11 or at ticket counter in Taiwan before the departure time 1 day or sooner ? Thank you very much for your assistant in advance. Thank you for your kindly help. I have already booked and paid our 2 train tickets online from Taichung to Taipei. We will travel Taiwan next week for 6 days. - Could you kindly drop some Chinese words for us to show the Shop Attendant at 7-11/Family Mart to help us operate the Kiosk ? Because I afraid that we maybe misunderstand by communicate by english! Once again, many thanks for your help ! Pick up form is not necessary. Booking code & your ID is enough. English is useful in Taiwan and ticket collection service is popular in Taiwan. Say "train ticket" and show them your booking code and ID to the staff, they will know how to help you. If you are afraid of misunderstanding, print the pick up form. Hi there, I did a booking but forgot the booking code. Have yet to make online payment. Hi. If i were to order and make payment online, will I still be able to collect it as the kiosk or I can only collect it over the counter at TMS? Also, does all the convenient shops have the kiosk available? many thanks. Yes, you can collect your tickets at TMS. However not many people will collect their tickets at TMS since long queue in front of the ticket window. Not all, but I think the possibility is less than 1/10000. I met one that didn't provide Kiosk in the remote area in the past 10 years. My staying place is near Xi Men Ding. Will the Kiosk be available at convenient shops such as 7-11, Family Mart etc? Or only available at 7-11 etc? Thanks! You can take your tickets at 7-11, familymart, hi-life, OK.
Hi Chen, regarding the Taroko Express, does it have intermediate stations from Taipei to Xincheng (Taroko)? And can I book the tickets online in advance and pay at convenient stores a few days before departure using cash? Yes, Taroko Express will stop at some intermediate stations. Each Taroko will stay at different station.BTW, Xincheng(Taroko) Station is a small station and not many Taroko Express stop there. What's the different between this question and your previous question? Flexibility trip is important to me since I'm always changing itinerary. If comfort is important to your trip, just book the Tze Chinag. My opinion may not be useful to you.I would come home one hour earlier rather than wait one hour in the train station. The same when you come back. If you are worried, just book the reserved tickets. Oh i see, because i will go with my 50 Y.O mom, i just worried she might need to stand for an hour during the trip to Ruifang station. So, basically if i go directly to Taipei Main Station without booking any ticket to Ruifang, i can go to any train boarding to Ruifang station right? I noticed that 3rd April is public holiday in Taiwan, would it be okay if i just go straight to Taipei Main Station and purchase the ticket to Ruifang station straightly? You can take any train except Taroko/Puyuma Express. If you take other express train, check with the staff whether the express train will stop at Ruifang or not. BTW, you can use easycard/ipass instead of buying train tickets. Please can you explain if I can book a ticket to travel from Tainan to Kenting by train and kenting express bus online? Do I need to get the train to Zuoing to then pick up the kenting express bus? Can I book my return kenting express ticket online?Which is the best bus to get and I need to return to Fangliao to get the train to Ruisui? p.s. HSR Zuoying station and Zuoying Train Station is in the same building but different track systems. i would like to know what are the differences between taiwan railway vs HSR, as right now from what i know the differences is, 1 is slower and cheaper than the other 1. but are there any other more reasons for me to take taiwan railway like much more sceneries that will help to make the ride interesting. Plus taiwan railway is available from taipei to kaohsiung right? coz right now at the website what i am seeing is Taipei→Hualien but Departure Taipei @06:12 and Arrival Kaohsiung 11:21. I cannot catch your question. If you are comparing the view between Taipei & KS, I would say no much difference. oh i am comparing the view by taking HSR and the normal train by taiwan railway. I know. But I cannot catch your standard.What is more sceneries? If I compare the railway view of west coast and east coast, I can say east coast is more scenearies since it go through villages, rice field,cliff, valley. Between Taipei & Zuoying, HSR is 400KM and railway is 363KM. Does meanS HSR is more sceneries? Hi, just to ask if one Easycard can be used in different cities like Taichung too? Yes, you can. Almost all public transportation accept easycard. Hi Sullivan, you are a life saver! 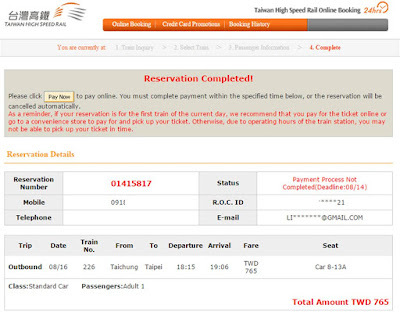 Just want to double confirm, I have booked my TRA tickets from Taipei to Chiayi for 5 Apr. If I pay by credit card now, can i collect after I arrive in Taipei on the 2 Apr? The ticket taking due time is confusing me as it says 2017/03/19 00:00. What does the ticket taking due time mean? I can collect it at train stations on the 2nd Apr right? The deadline is for payment.If you have paid before the deadline, you can take your tickets before departure. I would suggest collecting your tickets at convenient stores when you arrive Taiwan. You won't know how long is the queue in front of the ticket window. What is the difference between Toroko and Puyuma? Is it just different views, but they both bring me from Taipei to Hualien and vice versa and takes the same time (about 2 hrs)? If so, is it advisable for me to travel by Toroko from Taipei to Hualien then take Puyuma from Hualien back to Taipei to enjoy the different scenery during the train rides? Both are highest class train but provide by different manufactures. The duration is 2h~2.5h, not all Taroko/Puyuma stops at the same stations. The scenery is the same. If you can book Taroko/Puyuma Express, take them for your trip. However, the tickets of Taroko/Puyuma Express are difficult to book. You can try combo tickets if no tickets are available. I mean not the HSR, but the normal train which will go directly from terminal 1 to Taipei Main Station? Thanks so much for your kind help ya :) Hope to get the reply from you soon. wow! this really helps me a lot! one more thing to question, can we purchase easycard at Taoyuan airport terminal1? 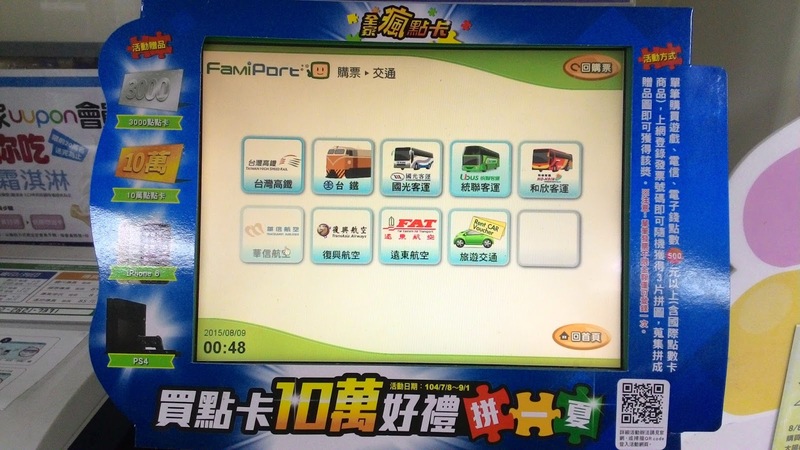 or the easycard only can be bought at 7-eleven store, etc once we reach taipei main station? Yes, you can buy easycard/ipass. There are also convenient stores at the airport. Hello! Just like to ask about the booking of tickets online. I'd wished to book tickets from hualien to yilan via puyuma for 4th April, but apparently the website states there are no more seats left. Does this mean there is no totally no possibility to book for the seats anymore? Thanks!! Train between Taipei & Hualien is hard to book in usual day. 4th April is the end of 4-days holiday in Taiwan. All transportation to Taipei is extremely heavy. Even the local train will be crowded. If you could, change to another day. Unfortunately, I have already confirmed accommodation at Toucheng Farm, so I cannnot change the date. Would it be possible to purchase non-reserved tickets for other express trains on the spot? If so, what would be the earliest timing I could purchase said non-reserved tickets? Thanks! If you don't care weather you can have a seat or not and stand all the way, you can buy non-reserved ticket. Since Toucheng is a small station, not many express train stop here. You can take local train when you arrive Luodong station. It is much easy to find a seat in a local train. You don't need any form. If you pick up your ticket at train station, give staff your id. If you pick up your ticket at kiosk in convenient stores, input your id number and booking code. What do you suggest for taoyuan airport to taipei main station? I was initially planning to take 國光1819. But found out that there is a metro available. I guess metro would be faster? There are direct train which stops at only 3 stations. But that won't make much difference different to you. Metro to Taipei is much easier for a foreign visitor since the station is easy to recognize. 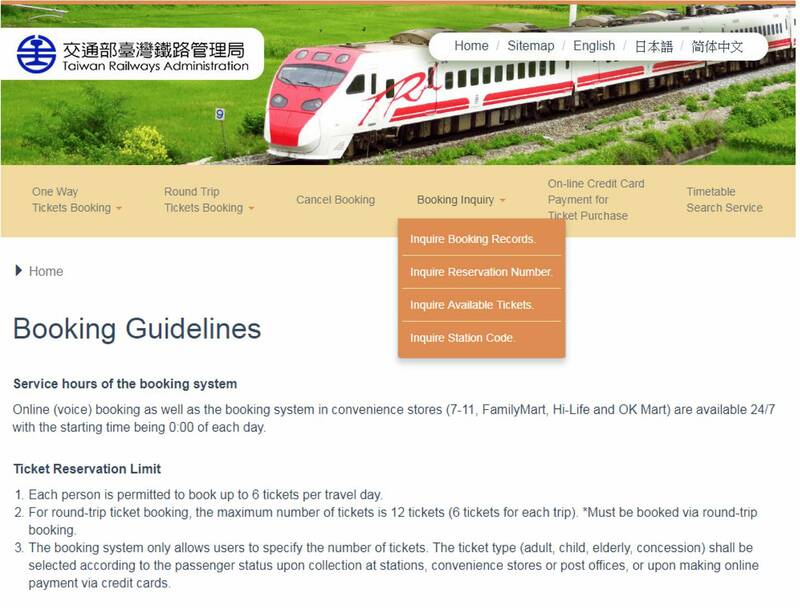 When I booked four THSR tickets online, I was not asked to input passengers' names. If I go to collect the tickets at the ticket counter or convenience stores, do I need to show the passports of all the four passengers? I am collecting on their behalf as I am arriving two days before them. Thank you. You can collect your tickets at convenient stores. The staff won't check the ID. Thank you for the informative. I'm travelling with 3 family folks (age 60 to 70 yr old). They are carying the big luggage due to the cold weather. As i'm travelling between the monsoon period (31 Aug to Sept). Is it still advisable to take this route? Or I should just take the internal domestic flight from taipei to hualien? Should I take on the internal domestic flight from taipei to hualien, am I able to take the train from hualien to see the Qingshui cliff? Sorry to bother you on the options. Would appreciate your advice so that I can make out the better choice for their needs. (3) I don't know what do you mean other route? The best traveling and popular season to Hualien is June~Nov. Weather is the problem for all routes in this season, not only for this route. I tried to book the train ticket, It list down the starting point and the ending station. However, for taipei express train station, is it near the airport? I wonder if i book the express train, the weather affecting the train will be cancelled. Will our paid ticket be refunded? Never encountered this issue. Hope it never appear on this trip. Very sorry for the situational issue. Thank you for the prompt advice. I shall continue to book the train ticket to hualien. Hopefully everything is fine throughout. Do not wish to encounter any typhoon. Would like to ask, If i bought the easy card at the airport, am I allowed to use it on the express train from taipei main station to hualien? (2) Total around NTD 400 if you take express train by easycard. You can use Combo ticket(NTD 210) with seat all the way. Are there any late night trains that goes to Taroko? What time is the earliest schedule? Hi, i am taking the express train from taoyuan international airport to taipei main station, and then take the TRA Tze chiang limited express train ride to hualien. How do i walk from taipei main station to the TRA counter. (1)Taoyuan METRO, TRA, HSR, Taipei MRT are different system. If you say express train, others may consider it is TRA (both express train and Tze Chiang are TRA train)and get confused that why you need to transfer within TRA station? (4) The time you arrive TPE matters, if you arrive in the afternoon, you can go to Hualien directly. Take a rest and go to Taroko the next morning. If you arrive TPE in the morning, you should stay Taipei for your first night and have a day trip to Hualien from Taipei. hi Chen. 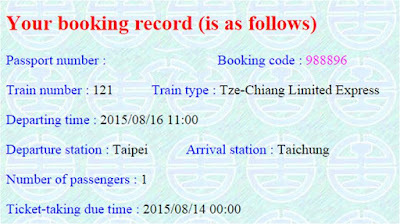 I tried to book the tickets on railway.gov.tw from hualien to taipei for express train on October 1. I will be travelling to Taiwan soon and trying to book online HSR from Taipei to Taichung for four people. However, I stuck at the page where it requires me to fill up GUI No. May I know can I skip this without causing any problems later? Do I need to fill up the particulars for other three passengers? That's code given to HSR corporation members. Hi, thank you so much for detailed explanation. Do you know what is the refund process for cancelled express train ticket? I read on their website, but I'm not entirely clear about it. If you take your tickets at train station,refund at any train station.If u take your ticket at 7-11,refund at 7-11. Hi, I find difficulty in booking TRA tickets online from Kaohsiung to Hualien and Hualien to Taipei. Is it possible to buy tickets in Taipei Main Station instead on 12 Feb? I am planning take the trains next week Thursday 15 February. Appreciate your suggestion! Thank you. You can try to book KAOHSIUMG-Taitung-Hualien. You can also go to Hualien from Taipei.It depends on whole itinerary. HI, very informative post Chen, thanks for posting. I am planning to Travel from Taipei to Xincheng(Taroko Gorge) on 15th Feb. I need to take an early morning train and I am trying to book tickets since last 2-3 days but it says no tickets available. I tried to split journey and looked for tickets to Hualien, Yilan but all are sold out. Can i take the Chu-Kuang express without reservation by buying ticket at station? I am reaching Taipei on 14th, so can i get ticket on 14th from station? Also, without reservation, how likely we are able to get seat as I am travelling with a baby. 2) Other option i was exploring is to take non-reserved ticket for Ch- express to Xincheng. Does non-reserved seat means that I would have to stand throughout the 3 hour journey or there are some seat for non-reserved tickets as well?. Also, can i buy this ticket in one day advance or does it need to be bought on same day. Also, how would i identify, which section of coach is for reserved vs non-reserved seat? dear mr. chen, from Taipei Main Station to Taichung Railway Station by TRA; from your own opinion, it's better for us to purchase the ticket via online or just walk in to the counter? For a foreign visitor, it is better to confirm all of your itinerary as early as possible. The ticket may be sold out when you walk in to the counter. I have booked and paid for TRA and HSR online. Can I pick the tickets from convenient stores at Taoyuan Airport? Thank you very much for your answer and your article. Hi Chen. Is it there has direct express train from Taoyuan Airport to Hualien? As many blog suggested from Taipei station to Hualien. No train to the airport, only metro system to the airport from Taipei Station. Hi Sullivan, I only managed to get the Chu-Kang train tickets via online booking from Taipei - Hualien. However, there is no mentioning of reserved seats. May I check as long as I manage to book & pay online for my Chu-kang train tickets online, there will be confirmed seats for us? Thanks in advance! Hi Sullivan, thanks for responding! However, may I know since we booked online, there will be a guaranteed seat, just that we will not know the seat number now only? Thanks! You will get a guaranteed seat if you book online. Except Taroko/Puyuma express, unguaranted seat tickets are unlimited issueds. Hi, I booked a ticket but need to modify the time. Is that possible? If so, how can I do that?